Monday was Valentine’s Day, and Mother Nature brought me a beautiful gift. Driving in to work that morning, just before the sun rose, the sky was painted in a beautiful pallet of color that reminded me of Easter. If you were like me when growing up (or even now as an adult), I loved to mix colors of dyes to make some of the most unique-looking colored Easter eggs. If I wasn’t dying one half of the egg in one color, and then turning it over to put in a second, I was constantly dunking eggs back and forth in different colors to reach various shades of purples and browns. Not one egg was the same as the next. Monday morning was no different. To the East, the sky was a bright Robin-egg blue with wide cloud of peach, cream, and orange painted across the sky as if with a wide brush. The colors blended together, making it difficult to know where one color ended and the next one began. To the North and West, it looked as if a giant slab of rose marble was placed in the sky. Shades of red and lavender were swirled together but not blended, making for a distinctive pattern. It was placed in front of a rich violet and dark blue sky, making the red in the clouds stand out even more. And to top this canvas off, to the South was an element of it’s own. Venus, in all her glory, has been shining brightly high above the horizon for a few weeks now. On Monday, she was hovering just above the cream-colored clouds as the stretched South. Refusing to yield to the power of the Sun, she shined brightly as all other stars faded away in the morning light. It wasn’t until the Sun was already above the horizon that she finally left us, taking the beautiful colors of the dawn with her. It was a shame that I was not sitting on top of a tall hill that morning with my camera to record the beauty of nature that morning. Hopefully you saw it yourself, or may you be fortunate to catch a morning like that yourself one of these days. It was truly a gift. As this “heat wave” melts all the snow in my yard, and with Spring just around the corner, it is time for another 6-week challenge. The quest to lose those pesky five pounds continues, and maybe the fourth time is the charm. To recap, the first six-weeks was standard exercising (sit-ups, push-ups, etc), the second six-weeks was using the Wii Fit, and the third six-weeks was using my Concept II rowing machine. This time we’re going to try something different. I recently purchased the Microsoft Kinect for the X-Box 360. For those of you who are not familiar with the device, it is a camera that attaches to the gaming console that follows your movements and computes them into actions in the video game. There is no need for a controller, and you cannot play the games from a seated position. So here is my plan for the next six weeks: 30 minutes of “playing” with the Kinect and 30 minutes of rowing (Monday through Friday). This should allow for muscle confusion and burn off those five pounds one and for all! To add to this, with Spring on the way, my weekends will likely be spent outdoors trying to get the rest of the yard to grow once again. I had good results at the end of the fall, so hopefully I can continue the success with the rest of the yard. PLUS, the yard work will help with tackling the five pounds. Also, you might find this interesting. In doing some research on metabolism, I discovered that Vitamin D (specifically, Vitamin D3) is generated by being exposed to UV radiation, such as sunlight. Vitamin D boosts your metabolism, so while not only working in the yard and exercising will help me lose weight, the Vitamin D generated by the sunlight will help as well. I think I will start the exercise challenge next week, as I am currently having to build a puppet stage for church. Once that’s done, I will have some free time after work. Are you ready for some football!?!?! The game is all set, featuring two old-school teams facing off to become the NFL Champion of the 2010-2011 season. Since my boys in blue will be watching this game from the comfort of their own homes tonight, I don’t have any particular favorite in tonight’s game. Both teams have some great strengths and both are equally capable of walking away with a win. My projection is … well, let’s wait a moment. First, let’s reflect on my New York Giants. They could have been in tonight’s game if they didn’t lose in that freaky game against the Philadelphia Eagles two months ago. However, it was because of their softer playing style this year that kept them from making the playoffs. If they had the focus that they had at the end of the 2007-2008 season, things could have been a lot different. Hopefully next season they will get their act together and make another strong run to the playoffs (that is … if there will even be a season next year). Ok, back to those other two teams. The Green Bay Packers have three Super Bowl wins, compared to the Pittsburgh Steelers six wins. If the Packers win, they will move into fourth place of teams with the most Super Bowl wins. Pittsburgh is trying to extend their legacy with seven wins, placing them two wins ahead of the Dallas Cowboys and the San Francisco 49ers (both teams have five wins). In watching both teams compete this year, and having many of the Packers stars on my fantasy football team this year, I would have to say the Packers play the more-complete game tonight and win by the score of 27 to 21. With that out of the way, let’s go back to the Giants. BIG BLUE! You will always be champions in my book. As you can tell from my little make-shift shrine, I love my team. Ever since 1985, I’ve been a die hard fan. I cheer for the Buffalo Bills (the only team to go to four consecutive Super Bowls), New York Jets (once coached by Bill Parcells), and New England Patriots (also once coaches by the Tuna), but against the Giants, they pale in comparison. So while I’m watching the Packers beat the Steelers tonight, I will be surrounded by the best team in the world. 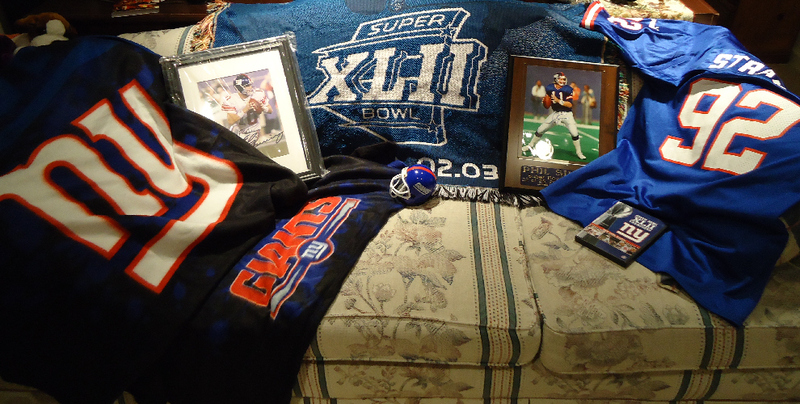 Representing will be my Super Bowl XLII throw blanket, my NY Giants snuggie, my Michael Strahan jersey, autographed photos of Eli Manning and Phil Simms, a copy of the road to Super Bowl XLII, and my mini NY Giants helmet (though I need a mini football helmet display case to keep it in). Here’s hoping for an awesome game tonight with no injuries and big plays! Is it ok for men to comment on wedding dresses? This time last year, I was making plans to travel to New York and support my friend in her first major promotional event for her wedding and events company. Later on in the year, the same friend had one of her brides featured in TLC’s program “Say Yes to the Dress.” Needless to say, I was very excited for her successes and shared my excitement with my other friends. One friend said that there was something “not right” about a man watching a program about wedding dresses, so it made me wonder – is there anything socially wrong with men taking an interest in such things? To be honest, I really don’t care about fashion in general. I’m your classic “jeans and t-shirt” kind of guy, and if you ask me what tie goes well with a dress shirt, I really couldn’t tell you. Ladies I’ve dated over the years have tried to alter my outlook on fashion including taking me to stores to update my wardrobe, but with no real success. When it comes to women and dresses though, I always seem to have an opinion – and men should as well. In watching “Say Yes to the Dress,” I’ve learned how dress styles are not transferrable for all shapes. 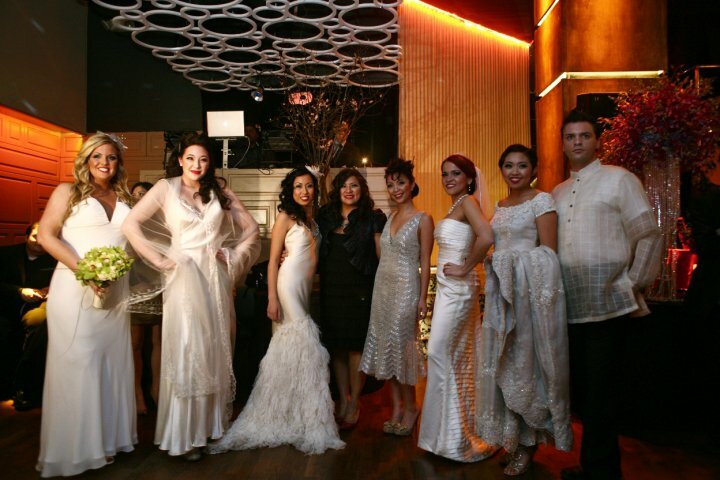 The designers use various cuts and dress embeleshments to accent what is best on the lady’s form. For example, wedding dresses for slender women might have ruffles below the waist line to accent their figure, but you don’t find the same design on plus size wedding dresses. In turn, a fuller-figured lady will have a more plunging neck line, but a softer curve will be found on petite wedding dresses. Let’s be real for a second – most men love the female form. If we didn’t, we probably wouldn’t have swimsuit calendars, super models, and beauty pageants. So appreciating a woman in something like ball gown wedding dresses or power suit is natural. However, commenting on it seems to be out of the norm. Men, let me tell you something. Women love your opinions on how they look. Why do they always ask you how they look? Take the moment and appreciate that a woman really does want you to check her out from head to toe. That way, you can better gauge which outfits and designs look better on her than others, and that will win you brownie points down the road. You are currently browsing the MODU's Musings blog archives for February, 2011.